Use your Mono Wifi to display the local weather forecast. To use this app, you will need an SD card. On your computer, open the downloaded Zip file, insert your SD card, and copy or drag the mono folder onto your SD card. /mono/wifi/ssid.txt: SSID of you Wifi network. /mono/wifi/password.txt: Password of you Wifi network. 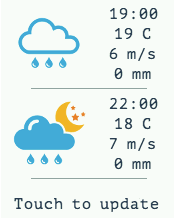 /mono/weather/city.txt: City that OpenWeatherMap understands. Examples: London. /mono/weather/countrycode.txt: Country code that OpenWeatherMap understands. Examples: gb. /mono/weather/timezone.txt: Timezone in ISO format. Examples: +0600. /mono/weather/unit.txt: Display style. Examples: metric, imperial. Each setting must be a single line of text without newlines, placed in a file in the proper folder on the SD card. For instance, /mono/wifi/ssid.txt means that the file ssid.txt must be placed inside folder wifi which again must be placed inside folder mono on the SD card. The app itself is named weather.elf inside the Zip file. Install it by connecting the Mono to your computer and running monoprog -p weather.elf.